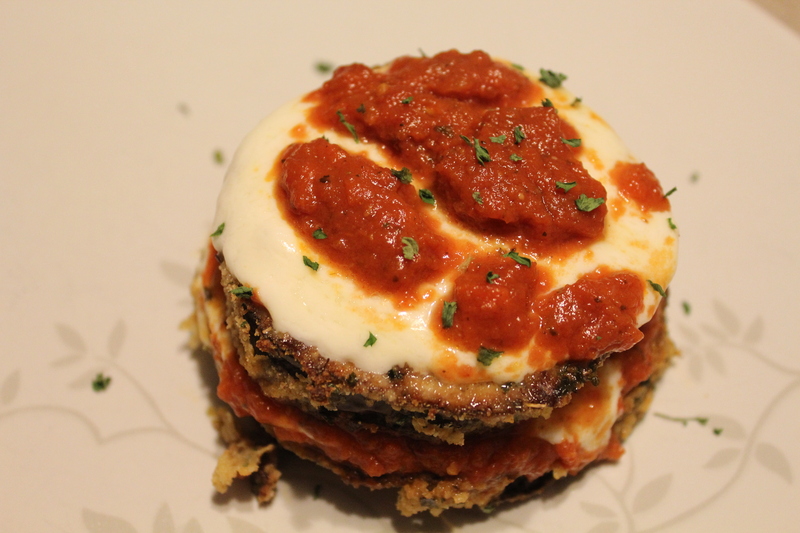 The last in my No-Meat Friday series, I give you my best recipe yet – baked eggplant parmesan! This takes a while to cook, about 45 minutes, so plan for it, but other than that, this recipe is really easy and tastes like it’s from a restaurant. The day you know you’re going to be making this, cut the mozzarella into slices, wrap them in a dish towel, put them in some tupperware, and put them back in the fridge. A couple hours before preparing this meal, take the cheese out and let it sit out on your counter. 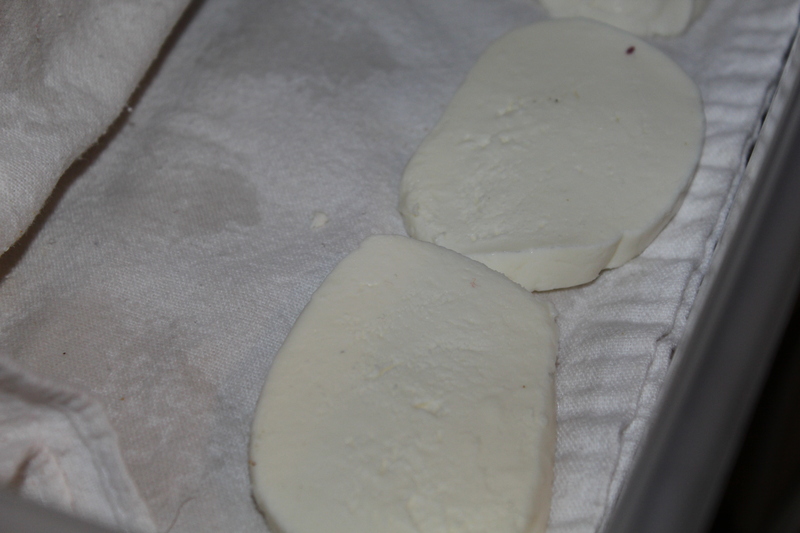 This is all to reduce the amount of liquid in the mozzarella. If you skip this step, your dish will be waaaaay too watery. 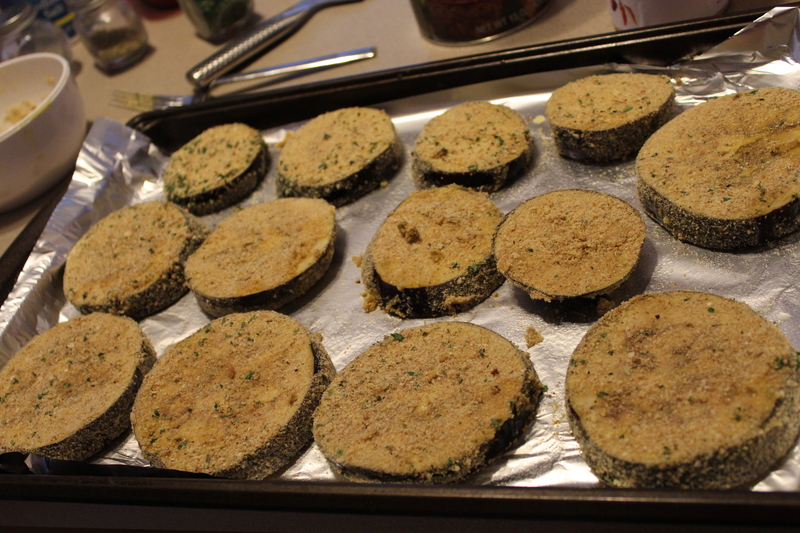 Cut the eggplant into round slices, about 1/4 inch thick each. 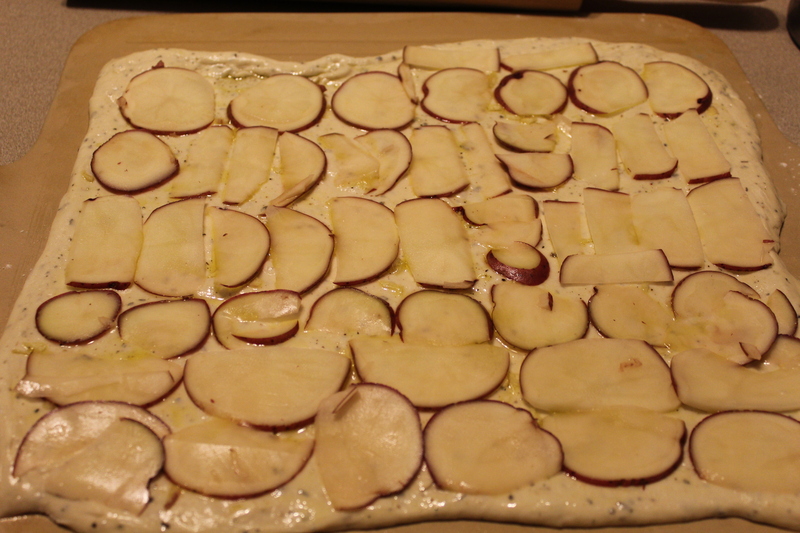 Lay them flat on a cutting board and sprinkle a good amount of salt on each slice. Let the slices sit for 10-15 minutes. Take a paper towel and push down on each slice, removing excess water and as much of the salt as you can get. Next, mix the two eggs in a small bowl. 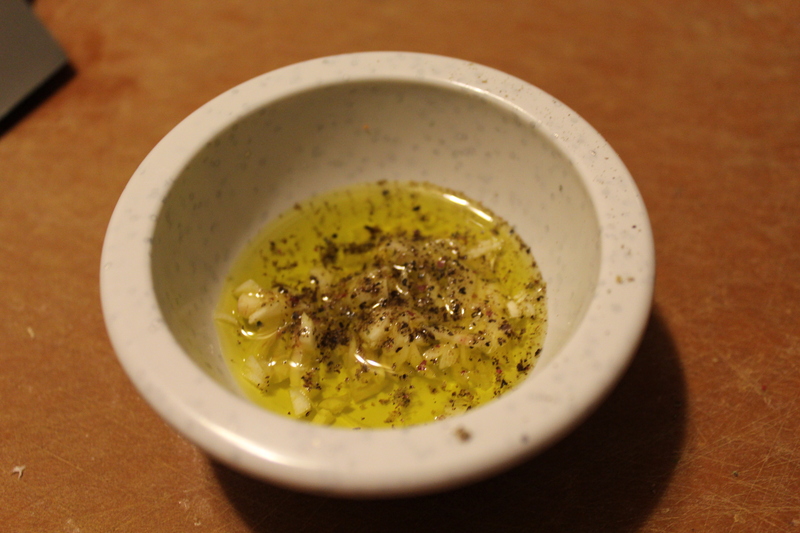 In another shallow bowl, mix the bread crumbs, parmesan cheese, parsley, basil, and oregano. Dip an eggplant slice in the egg mixture, then dredge it in the bread crumb bowl. Try to make sure each slice is covered. Put the slices on a foil-lines and cooking sprayed baking sheet. Cook the eggplant for 15 minutes, turn the slices over, then cook for another 15 minutes. Note that you can fry the eggplant slices, but the frying and the oil drives up the calories. Baking the slices cuts calories, but still gives you the breaded taste. It’s up to you. In the mean time, spread the pasta sauce on the bottom of a baking dish. When the eggplant are ready, make the stacks. 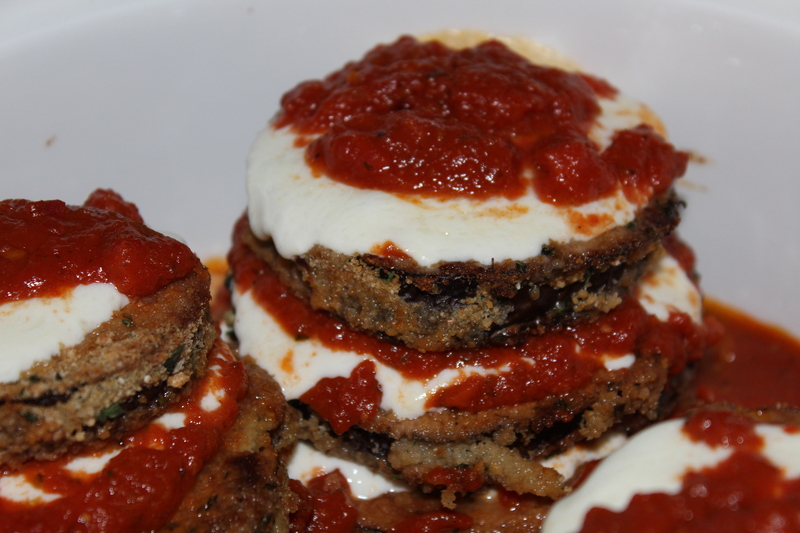 Put a piece of eggplant on the bottom, then layer a slice of mozzarella on top, followed by some sauce. I made 4 stacks of 4. You can add extra seasonings on top if you want. Put the baking pan in the oven with the lid on for about 5 minutes. Take the lid off and continue cooking another 10 minutes or so, until the cheese is melty and the sauce is warm. I found this dish to be very filling. 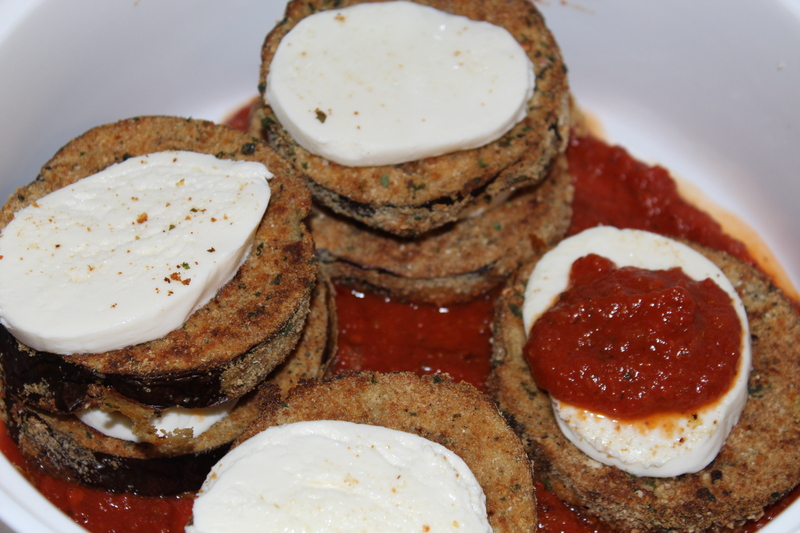 In fact, I was only able to finish half of a stack for dinner, meaning I only ate 2 of the eggplant slices. Dan did manage to eat a whole stack. This recipe gave us a dinner and a lunch a piece in leftovers. And so ends my No-Meat Fridays series. I hope you enjoyed it! 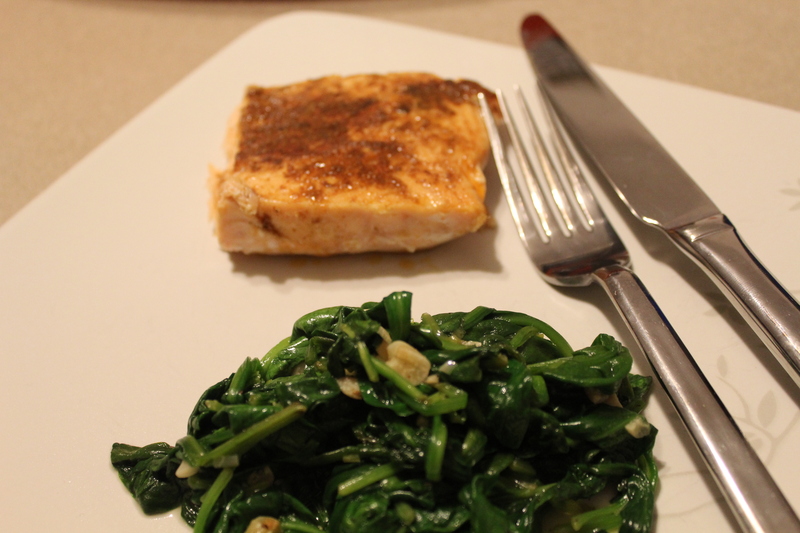 Here’s my fifth dinner in the no-meat series – salmon and spinach. Dan actually proposed this meal, and I was a bit skeptical. I tried salmon a few different ways without success before I finally found the pepper jelly recipe as my go to. I don’t know what it is, but I’m really picky about my salmon. This meal was quick and easy. The part that takes the longest is measuring out spices and chopping the garlic. straight from recipes we found online, I won’t re-type them here. I did make one edit to the spinach though. No lemon juice (we didn’t have any) and no butter (to keep it healthier). I don’t think those ingredients were missed, as the spinach was still packed full of flavor from the garlic. 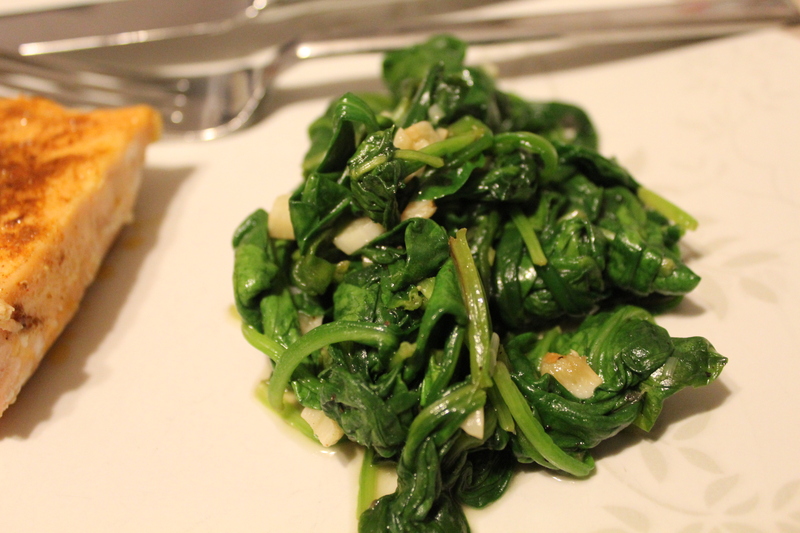 I was really surprised at how much the spinach wilted down though. When I put the spinach in the pot, I could barely fit it all. By the time it was ready to eat, the spinach didn’t even cover the entire bottom of the pot. 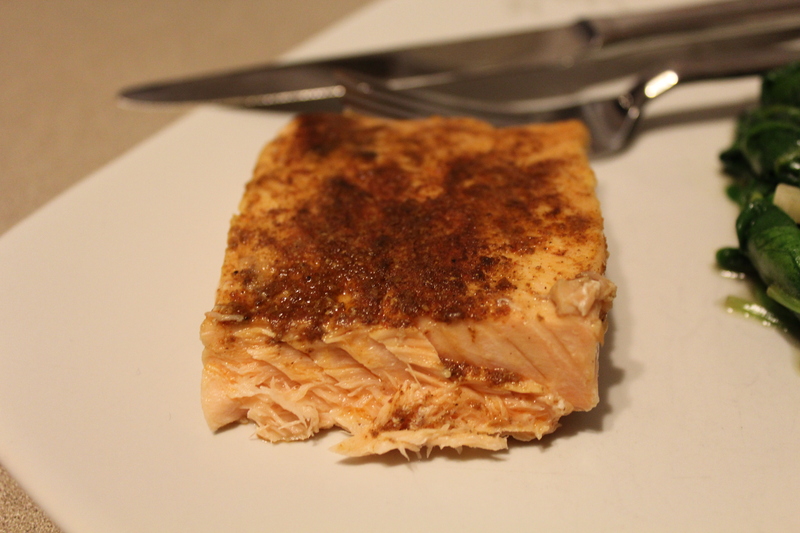 I was equally surprised at how well the spice rub stayed on the salmon. I thought a lot of the spices would be lost in the pan while searing, but that was not the case. Total cooking time – about 20 minutes for a healthy and tasty meal. Week 4 of no meat on Fridays. This is really cutting into our date night options, as if we go out, I usually tend to pick a meat dish. I didn’t really notice that until I realized I couldn’t have 3/4 of the items on a menu. I don’t know how vegetarians do it! As such, we’ve taken to cooking in on Fridays, so I’ll be able to enjoy a delicious meat-free dish each week. This dish is definitely a keeper. Yes, it would seem like this is carb overload, but it really didn’t feel that way as I ate it. 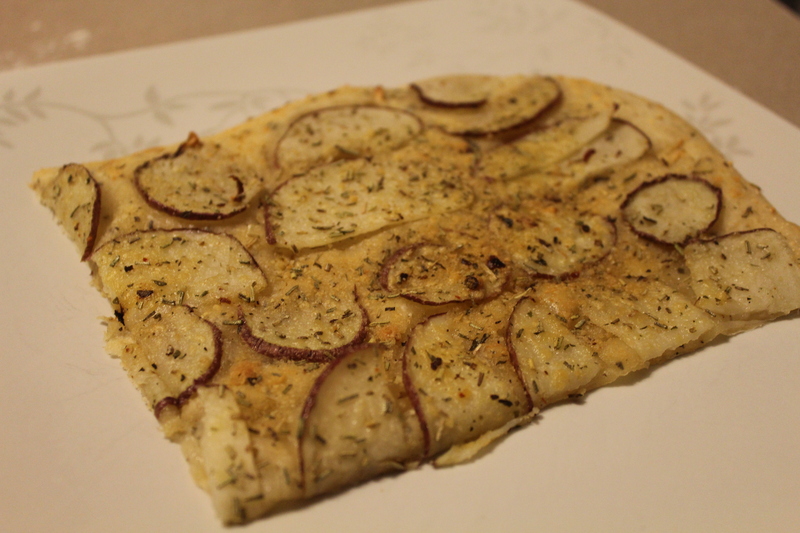 Plus, the flatbread seemed like it was a kind of a fancy meal. Definitely restaurant-level quality. Pair with a good wine and you have yourself a great stay-in date night. I started with store bought dough from Trader Joe’s. I went with a kind I hadn’t tried before – garlic and herb. I highly recommend it. 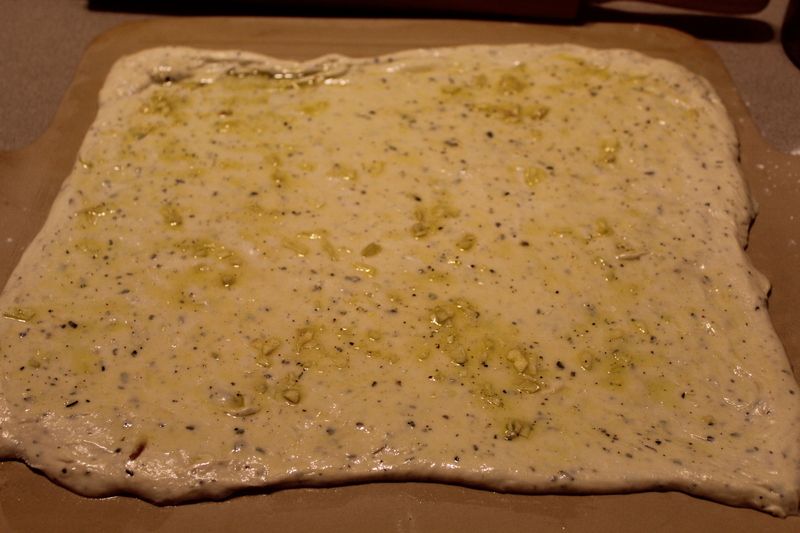 You can make your favorite dough recipe – just up the amount of garlic and rosemary you add. Let it sit out for about 20 minutes, then roll it out to a 12 inch square. 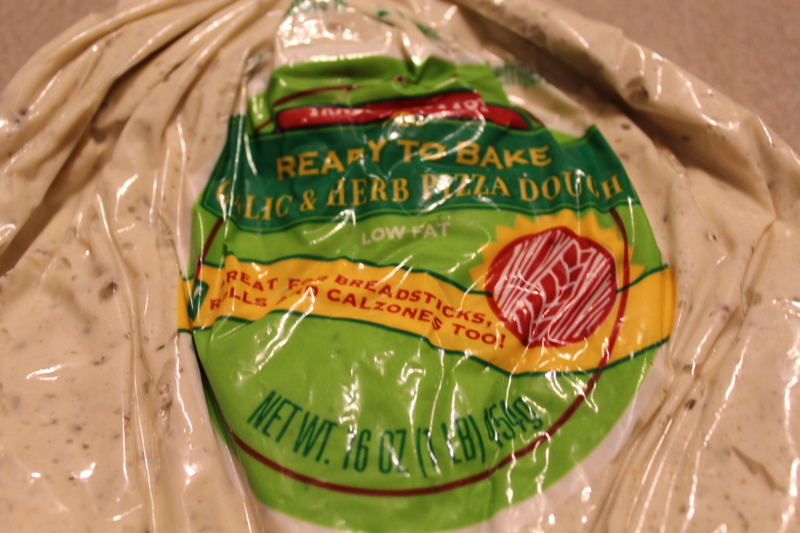 and brush it onto the dough. Spread the thing potato slices out onto the dough. Try not to stack the potatoes. Top everything off with the sea salt, pepper, and Parmesan cheese. 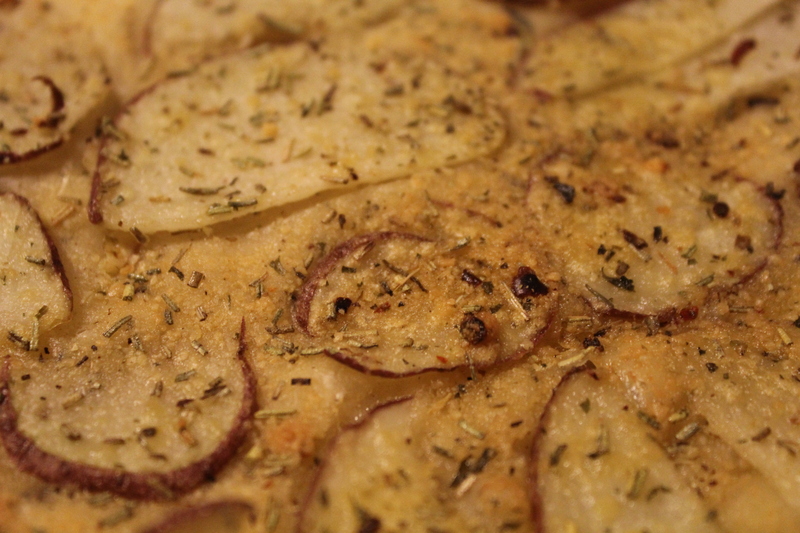 Bake for about 15-20 minutes, until the crust turns a little brown and the potatoes are soft and fully cooked. I thought this was a great quick and easy Friday dinner. Week 3 of Fridays during Lent is here. It’s cold, a little snowy, and cloudy all the time. 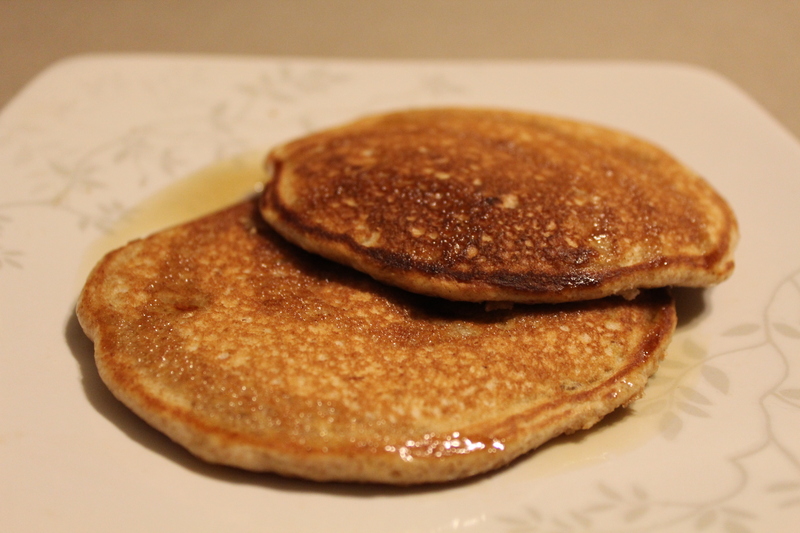 To me, this is perfect breakfast for dinner weather. Heck, you can even wear your PJs when cooking and eating this meal for extra comfort (and warmth!). 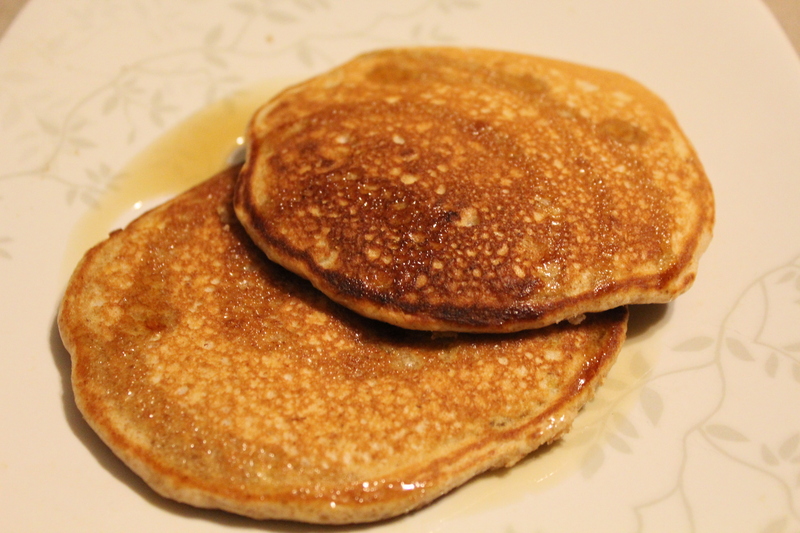 These pancakes are healthy and hearty. Start by sifting together the flour and baking powder into a small bowl. 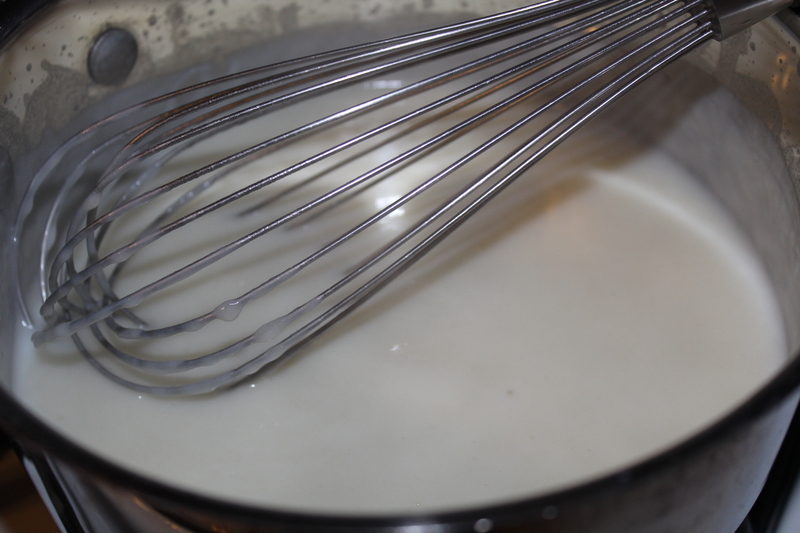 In a separate bowl, mix the egg, milk, salt, sugar, honey, and extract together. Mash up the banana and then add it to the liquid mixture. Slowly beat in the flour mixture. Then, just make pancakes on your griddle as usual. Another great meat-less alternative for dinner. Look at this – I’m actually following up my post from last Friday with another meatless dish to enjoy this Lenten season. I went with a true meat-free staple – pasta. 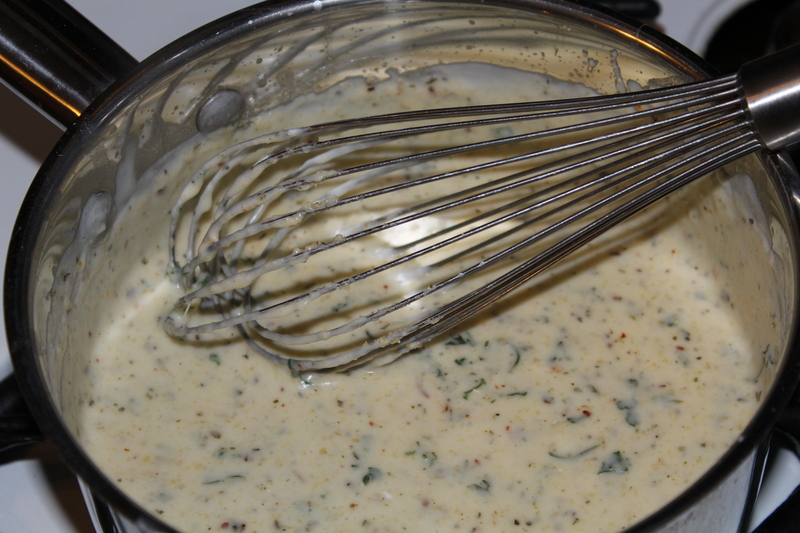 As I prefer non-red sauces, I decided to go with an alfredo sauce. 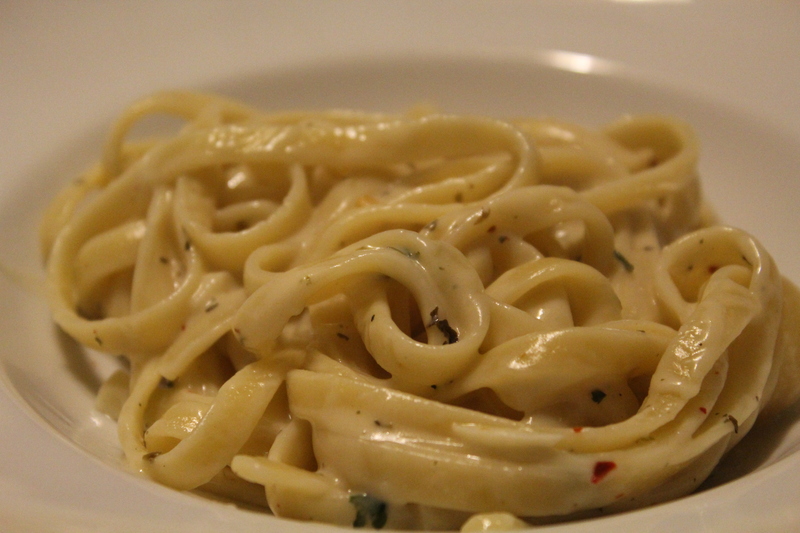 But, as we all know, alfredo sauce can be very, very fatty. I’ve been very good lately, working out to a Jillian Michaels DVD no less than four times a week (I’m on Level 2 of the 30 Day Shred) and watching my portion sizes, so as much as I love a good alfredo sauce, I wasn’t going to let it undo all the hard work I’ve put in to getting fit. 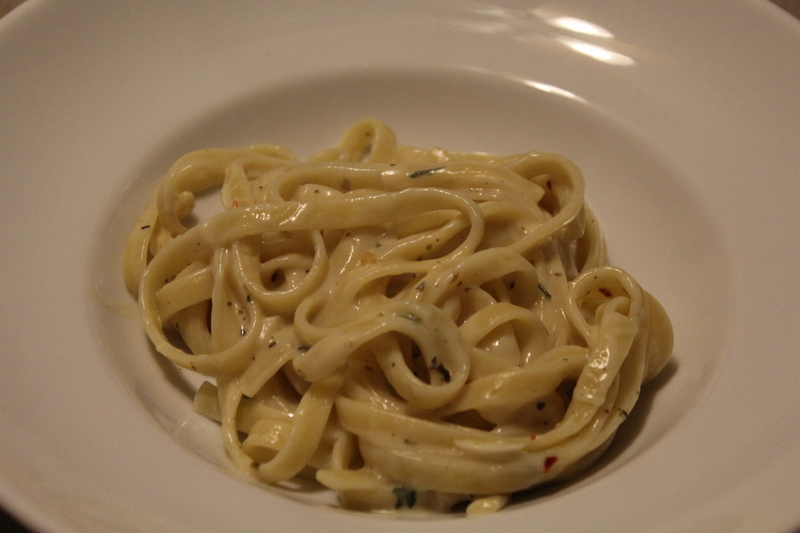 So, I decided to find a way to make the skinniest alfredo sauce I could without sacrificing taste. Start by boiling a large pot of water. It will take a while. Next, heat the butter on low heat and add the chopped clove of garlic. Let it cook for a few minutes, until the garlic is transparent. Add the flour and stir so it doesn’t stick to the bottom. Add the milk and parsley (and any other spices you’re using). Keep stirring for a while, around 5 minutes or so. This is the part I always have trouble with, which is getting the mixture to thicken. I find that letting the sauce simmer on low heat, without stirring, for a few minutes works well. Some of the liquid will boil away and when you go back to stir, the sauce will be thicker. At this point, the sauce is almost done. Add in the cream cheese and Parmesan and stir until it is all melted. About 15 minutes before the sauce is ready, drop a box of fettuccine (whole wheat is best) into the boiling water. Add a generous amount of salt and stir occasionally, so the noodles don’t stick. When the fettuccine is cooked, drain the water, saving about 3/4 of a cup. Return the pasta to the pot, add the sauce (it will be thick), and about 1/2 cup of the reserved water. Stir until the sauce is evenly distributed. If the pasta is too dry, add more of the water. Otherwise, serve and enjoy. In the hopes of helping others with my weekly Friday Lenten conundrum of what to make for dinner, I’m going to try to start a Friday blog series of great no meat dishes. Let’s see how long this lasts before I resort to grilled cheese and tomato soup. This fabulous meal needed few ingredients and took less then 20 minutes to prepare. In fact, the thing that took the longest was waiting for the rice to cook. It’s prefect for your Lenten, no meat Fridays. 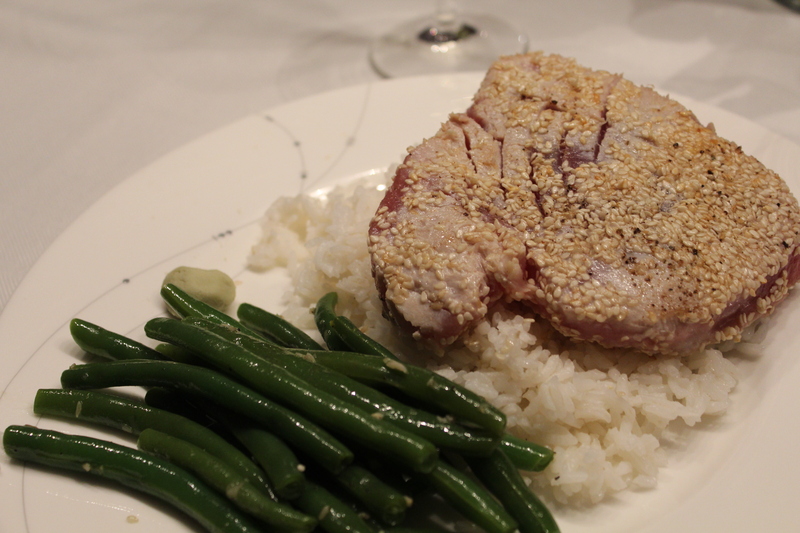 We made seared sesame encrusted tuna steaks with green beans, rice, and wasabi. First, get the rice going. We used our rice cooker to make a cup of rice, which was more than enough for the two of us. Also, warm up a saute pan. It needs to get HOT. I used the rice cooker for double duty and put a steamer basket on it for the green beans. I but the beans in as soon as the rice started cooking. Next, start on the tuna. 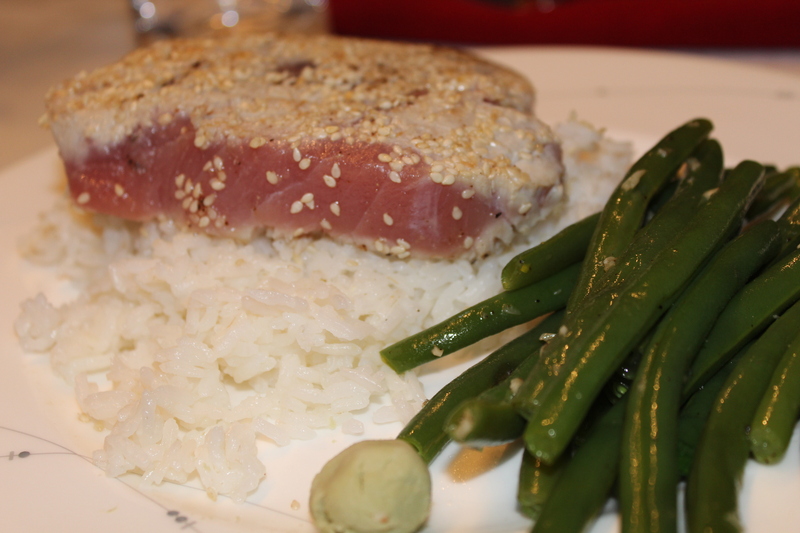 Rub the tuna steaks with the sesame oil and sprinkle with salt and pepper. Pour the sesame seeds into a shallow dish, and dip the tuna steaks in. Try to cover all sides. We ran out of sesame seeds, so ours weren’t fully covered. Chop up the green onion and garlic. Put some olive oil in a pan and start cooking the garlic for the beans. Once the beans are done steaming, toss them and the onion, pepper, and salt. You’re not cooking the beans, you’re just keeping them warm, so keep the heat on very low. Once the pan for the tuna is really, really hot, drop in the steaks. Let them sear on each side for about 1-2 minutes. More like a minute and a half, actually. You’ll want to get a good sear, leaving the middle warm, but mostly raw. Once everything is ready, put the rice on the plate and the tuna steaks on top. Get a little wasabi to eat with each mouthful of tuna and rice. It kind of tastes like a tuna roll, minus the seaweed. Like I said, start to finish in about 20 minutes. 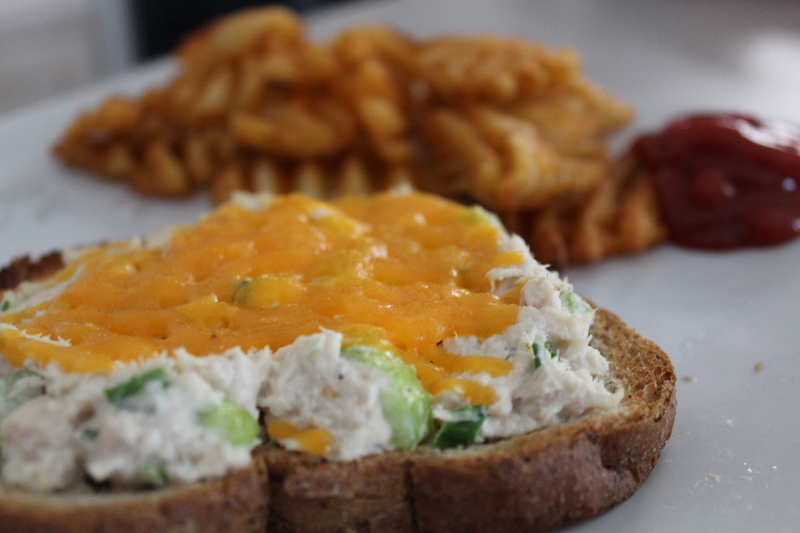 If tuna steaks weren’t so expensive, this would certainly be added into our weekly dinner rotation. Even with the expense, it’s still a pretty cheap meal considering it’s restaurant-quality, made at home.